Homocysteine Supreme by Designs for Health has eliminated headaches and provided energy without that anxious feeling! My Primary Physician placed me on Homocysteine Supreme by Designs for Health, and it has made a difference in my energy level.I love it!! Put my Homocysteine numbers right on target!! Got an energy boost with Homocysteine Supreme by Designs for Health, as you'd expect from a B Complex. Other Ingredients: Cellulose (capsule)‚ vegetable stearate‚ silicon dioxide. Due to severe fatigue and brain fog, heterozygous MTHFR mutation, and large red blood cell size, my Functional Medicine PA suggested I take Homocysteine Supreme by Designs for Health after separate methyl-B-12 and folate supplements didn't help. 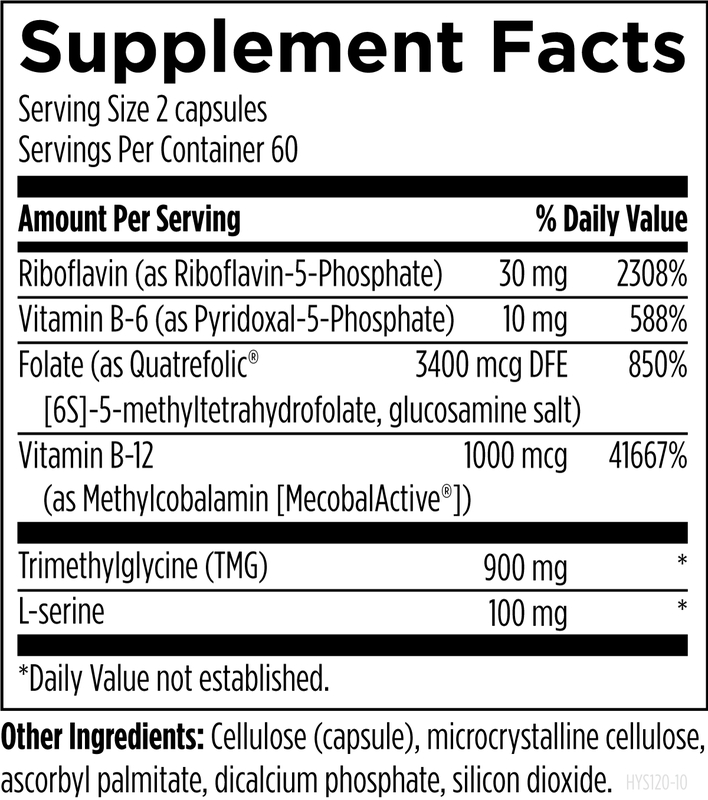 I've been taking HS for approximately 10 months, and it's been one of the most impactful supplements I've ever taken. Cell size is back to normal (yay! ), but the biggest change is the major reduction in brain fog--it's now limited and often completely gone. I highly recommend this product. It's a quality supplement that works. A little expensive, but it's worth it. After about 6 months of use, the homocysteine level in my blood was reduced significantly. Am looking forward to the next lab report in a few months to see if it has been lowered further. Taking Homocysteine Supreme by Designs for Health has really helped! I've added Homocysteine Supreme by Designs for Health to my wonderful USANA Health Sciences Cellsentials multivitamin kit for an even better "hit" of the nutrients that help keep homocysteine levels down. I've used this for years. It supports the lowering of homocysteine levels, which is a more accurate marker for predicting heart/artery disease than floating cholesterol levels. 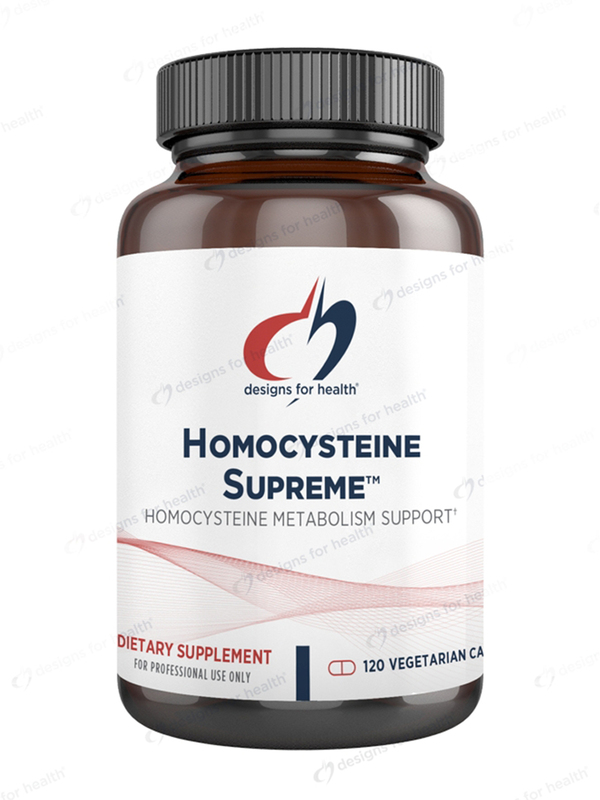 This Homocysteine Supreme™ by Designs for Health was suggested by a naturopathic physician and it has been most helpful improving homocysteine levels and the effects have been noticeable. The product arrived in a timely manner and this was not the first time it was ordered. 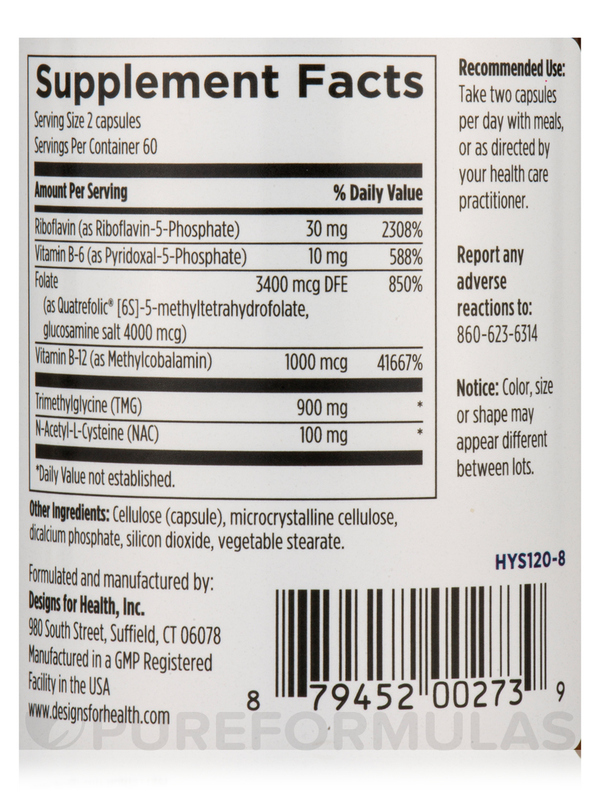 Homocysteine Supreme by Designs for Health seems to help my inflammatory response when I eat foods that contain ingredients that I'm sensitive to by when eating out. It contains the right mix of ingredients for me. I am ++ for the MTHFR genetic mutation. My doctor basically told me that I will not metabolize sugar like normal people and this is why I struggle with weight loss. I exercise, eat clean and just cannot get the scales to move without feeling tortured, no way to live! I have always been a high energy person who loved her caffeine. What I did not know was I could feel great, full of energy and need so little caffeine or none at all. I soon will be 62 and am loving the fact that my weight loss is easier than it has ever been. I will never stop using Homocysteine Supreme by Designs for Health! I also only trust those brands manufactured with high standards such as this company does. Natural energy, results from good diet and exercise! Nothing to dislike. I recommend it all the time. Mr. doctor prescribed Homocysteine Supreme by Designs for Health several years ago. It's a silent defender of the immune system... and you cannot feel it working. But it seems to work for me. An immune fighter.... twice a day and it keeps on fighting for you! There is nothing to dislike about this product! Our primary physician put my husband on Homocysteine Supreme by Designs for Health, and it has made a big difference for him. Has been taking for about a year and will continue to take. Is the folate in homocysteine supreme L-5 mthylfolate or L-5 methyltetrahydrofolate? Thank you for reaching out to us! The bottles does not indicate precisely which type of L-5 is being used. We suggest contacting the manufacturer for more detailed information.